White Front Side and End Bath Panels. BRANDED NAMES. BRITISH MADE. IN STOCK. LOW PRICES. Standard Size. Extra Large. 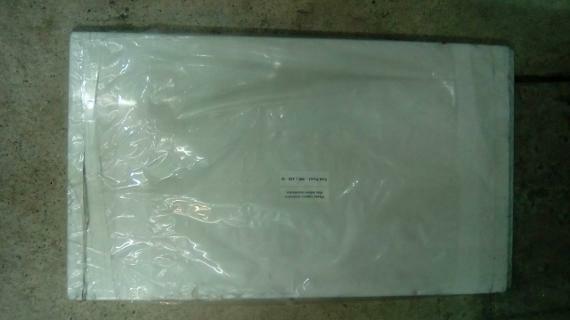 White Durable high quality Acrylic bath Panels. 1700 (1680mm) bath front side panels. 700 (690mm) and 800mm Extra wide end panels. Regency 1800 Colonial Front Panels. White And A selection of colour Bath Panels are In Stock and Ready To Take Away. Jsl Bathrooms. Bradford. Yorkshire. White Acrylic Bath Front Side And End Panels. Regency Colonial Bath Panel 1800 x 510mm. Roman Style. Heavy Gauge Acrylic. Acrylic White Bath Panels. British Made By Aquarius and International Bathrooms. 1700 Front Side Panel Approx. (1685mm x 510mm) £15. 700 End Panel Approx. (690mm x 510mm) £10. 800 Extra Wide End Panel Approx. (800mm x 510mm) £15. 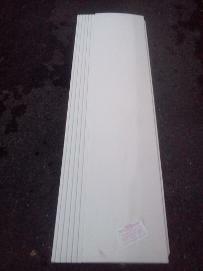 1800 Extra Long Front Side Panel (Regency) £50. 900 International XXL End Panel. (900mm x 450mm) £40. These panels are fairly flat in design. Front Side Panels have a slight bow towards the middle of about an inch or so. It is this curve that gives them the added strength that such a span would require. They are also fairly plain, with just the 'Cut To' lines at the bottom for a cleaner finish. Regency bath panels are embossed with fluted colonial embellishments. Pictured: International Bathrooms Heavy Duty Bath End Panel. British Made Of Acrylic. Measures Approx. 900mm in Length x 450mm In Height. 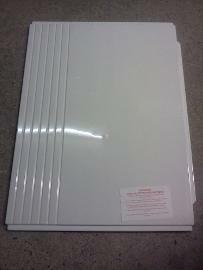 White Acrylic Fiberglass Bath Panels Ends And Front Sides. Metal Baths. Acrylic baths. British Made Strong Durable Quality Bath Panels. Made By Ideal Standard. Armitage Shanks. Aquarius. Spring Bathrooms. White Acrylic Bath Front Side Panel Size Ranges include 1200mm 1400mm 1685mm 1700mm 1800mm. White Acrylic Bath End Panel Size Ranges Include 690mm 700mm 750mm 800mm 900mm. For Obsolete Colours In Bath Panels Please Email Us, Please include Size If Possible.